The Naples Academy of Fine Arts is among the oldest academies in Europe. It was founded in 1752 at the behest of Charles III of Bourbon and was situated on the premises of the church of San Carlo alle Mortelle, the site of a pre-existing sculpture workshop. In 1780 the academy was relocated to the premises of the university (now the National Archaeological Museum) and moved again in 1864 (just after the Kingdom of Naples became part of united Italy) to the current premises, the ex-convent complex of S. Giovanni delle Monache. The nucleus of that convent goes back to 1593. The monastery was closed under the reign of Murat in the early 1800s, but later reopened. In the 1850s, a massive restructuring of this ancient area (adjacent to the submerged Greek walls of the city) included the demolition of a nearby city gate and the laying of a new street that divided the convent church from the convent itself. The convent was then closed by the new Italy and restored to become the new art academy by Errico Alvino (1809-1876),* a professor at the academy and the architect in charge of the general rebuilding of the entire area. The academy is near the Bellini Theater, the National Archaeological Museum and the music conservatory. The entrance is marked by two bronze lions, the works of Tommaso Solari (1829-1897), a prominent Neapolitan sculpture of the day. The entrance fronts on a pedestrian mall with the sidewalk cafes typical of many such places in Europe where young artists and musicians gather. 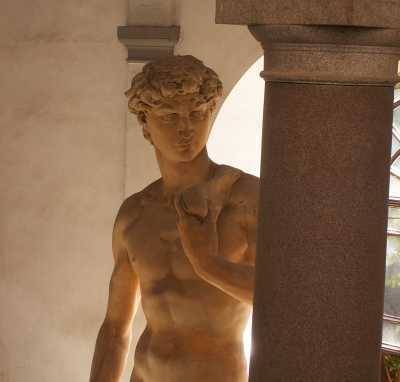 Inside, there is a monumental double stairway (guarded by a replica of Michelangelo's David—photo, above) that leads up to a small theater, lecture halls, workshops, library, and art gallery on the two floors above and around the central courtyard; the stairway is the work of Giuseppe Maria Pisani (1826-1923). *2 The art gallery holds a large collection, mostly of works by artists connected in some way with the academy itself. Currently, the curriculum is structured around courses of study of two years and three years in six departments: decoration, graphic design, painting, art restoration, stage and set design, and sculpture. The department of art restoration provides an additional two-year graduate program specializing in modern and contemporary art. *Alvino was from Rome but was particularly active in Naples. His architectural output was prodigious. Besides the Art Academy, his other works in the city include designing the façade of the church of S. Maria di Piedigrotta ; laying out (with others) what was effectively the first tangenziale in the city, the long east-west road, Corso Maria Teresa (today called Corso Vittorio Emanuele II, completed in 1870); planning the restoration of the façade of the Naples cathedral; redesigning (with others) the seaside park, the Villa Comunale, and adjacent area; and designing the main train station (1866), (eventually replaced in 1960). *2 Pisani studied under Alvino at the art academy. When Alvino died in 1876, Pisani took over his position. He worked to finish his teacher’s projects; on his own, he designed primarily religious architecture in Naples and elsewhere in southern Italy. He had a reputation as a very creative architect and, above all, a humble person. He gave away his possessions towards the end of his life and retired to a single small room. His tomb at the Poggioreale cemetery was designed by one of his students, Silvio Castrucci.